Environmental Performance | Lubrizol Advanced Materials, Inc.
A lot of companies claim to be sustainable, but proving it requires going through the rigor of an independent 3rd-Party Certified Life Cycle Assessment (LCA). Download our white paper. Ensuring superior environmental performance can’t be achieved simply by red-listing certain materials, because often the alternatives are no better for the environment. That’s why FlowGuard Gold® Pipe and Fittings has taken the extraordinary step of being the first hot and cold water distribution piping brand with a product specific cradle-to-grave LCA and environmental product reports (EPRs). Our reports provide industry leading transparency about the environmental impacts of a FlowGuard Gold plumbing system and allow for head-to-head comparisons of common plumbing products. FlowGuard Gold Pipe and Fittings has received the Home Innovation NGBS Green Certification and is the only residential plumbing pipe system to do so. The use of FlowGuard Gold plumbing systems results in points awarded toward project certification under ICC-700 National Green Building Standard. FlowGuard Gold CPVC has been independently verified as an eligible product due to improved environmental impact measures by an average of 15% or greater. The manufacturers of our CPVC piping materials requires less energy and produces fewer greenhouse emissions than other piping materials, as reported in the “Life Cycle Inventory (LCI) of the Production of Plastic and Metal Pipes for Use in Three Piping Applications”. Also, since our plastic pipe and fittings do not corrode, they are likely to last longer, reducing the need for replacement materials. CPVC can be recycled into drainage piping or window profiles. It can also be ground into pellets and granules for use in many products, such as floor fillings/coatings, speed bumps and car mats. Lubrizol is committed to providing accurate, transparent information about our products. That’s why we recently completed the pipe industry’s first life cycle assessment. The LCA, which is third- party verified and conforms to ISO 14040 and 14044 Standards, outlines the environmental impacts of FlowGuard Gold CPVC compared to other materials. It also allows specifiers to earn LEED credits. Learn more about the results of our LCA and how to apply the the documentation to your project. All of the environmental performance data on FlowGuard Gold pipes and fittings are ISO compliant, assembled and reviewed by independent 3rd party experts. But our branded reports aren’t the only source for reliable information on product environmental performance. NIST BEES Online (Building for Environmental and Economic Sustainability) software measures the environmental performance of building products by using the life-cycle assessment approach specified by ISO 14040. All stages in the life of a product are analyzed: raw material acquisition, manufacture, transportation, installation, use, and recycling and waste management. The software allows for the comparison of CPVC and PEX under the “Domestic Water Distribution” category. Users can select materials for comparison based on house size and whether hot water usage will be clustered or spread out throughout the day (“cold start”). Users can also customize the environmental impacts based on the transportation distance from the manufacturer to your house. 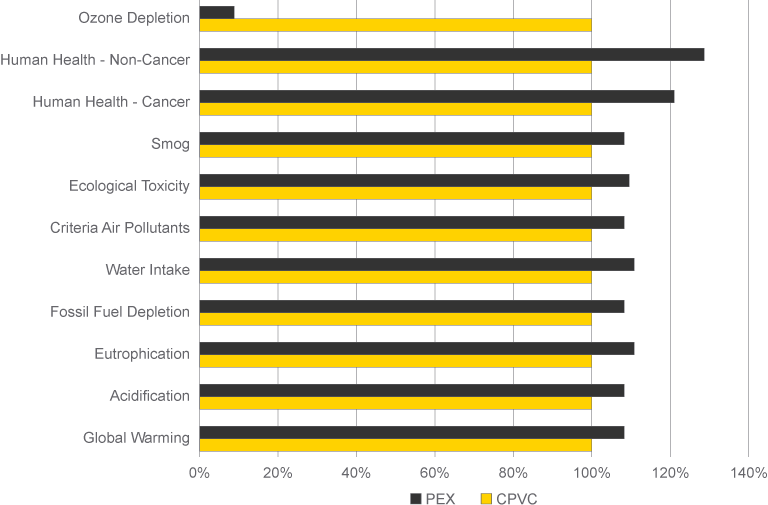 In a heads-up, ISO compliant comparison of CPVC and PEX in a large house, with a clustered use pattern and the same transportation distance, CPVC is shown to be superior to PEX in 10 out of 11 measured categories.